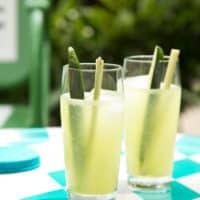 Lemongrass Cucumber Cocktails | Good. Food. Stories. The pathetic state of my front yard should not be taken as a personal rejection of grassy, green things. Far from it—the sad, messy weed garden I’ve been, uh, cultivating on that side of our house is more of a statement on a) my laziness and b) where I would rather spend my time when the weather’s fine. Come around back, where we’ve got shady trees, a sweet Marimekko umbrella, friendly midcentury patio rockers, and—maybe most importantly—a well-tended Weber, and you’ll find our green oasis. Even if the caterpillars are happily mowing down my parsley (which happens every damn year, I can’t stop it), I’ve still got rosemary and citronella plants for fragrance and grapevines for ambience. It’s calm, it’s breezy, and it’s ready for you to stop by and have a drink with me. If I could grow it in New Jersey, I’d probably barricade both the back and front yards with borders of lemongrass. Trust me, I’ve tried, but the tropical plant never survives our winters. So I’m forced to buy fresh stalks at the supermarket and turn them into refreshing, not-too-sweet cocktails that taste as green as they look. On its own, the flavor of lemongrass can tilt toward non-edible applications: soothing lotions, essential oils, and other spa-centric stuff might spring to mind when you first sniff it. But when paired with other herbs and aromatics (like you’ll often find in Thai food), its citrus notes are wildly bright and zingy. Think about how many ways there are to use fresh ginger when cooking, and you’ll find the same versatility with lemongrass. The plant can be intense, so if you want to showcase its incomparable taste and scent, you don’t need to do much—or use much—to unleash it. Even though I love it immensely, I find that lemongrass can actually be a little overpowering on its own. But when paired with its good friend, the subtly sweet and cooling cucumber, the balancing act works and the cocktail goes down easy. 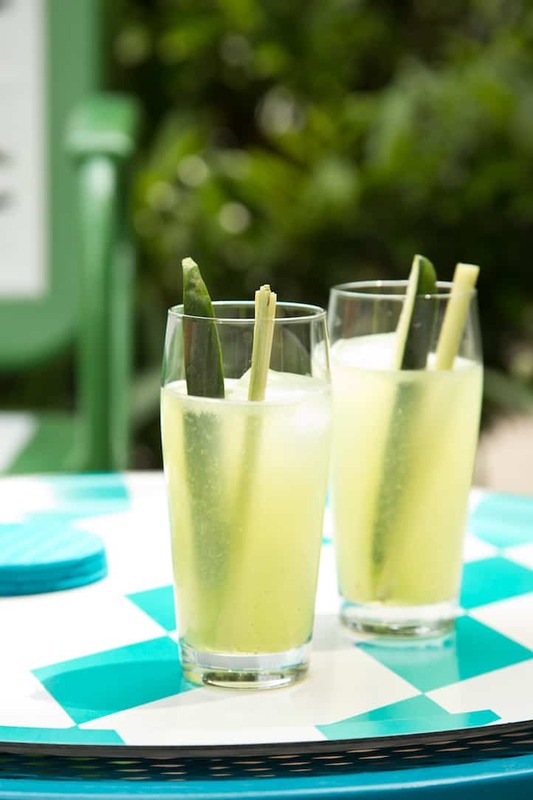 Here’s the thing: this cocktail is tailor-made for big-batching and prepping in advance for parties, and the do-ahead work is minimal, but it does require you to make fresh cucumber juice. While you absolutely don’t need to own a fancy juicer to make cucumber juice, it does make the task more efficient. I get about 1 1/2 cups cucumber juice from every pound of cucumbers I run through my Hurom slow juicer, and about 1 cup juice per pound of cucumbers using the food processor method. “Method” might even be stretching it for terminology—you can probably figure this out on your own, but I wouldn’t be a recipe developer if I didn’t give you a full explanation. Rinse but do not peel your cucumbers; you want that vibrant green color coming through in your cocktail. Roughly chop the cucumbers, then add to the food processor. Process, scraping down the sides of the bowl as needed, until the cucumber pieces are broken down into a thick puree. Place a fine mesh strainer over a bowl. Strain the puree, pressing gently to extract as much juice as you can. The juice will be cloudy, but that’s ok. Refrigerate until you’re ready to batch and serve your cocktails. I would recommend buying an extra cuke or two just to be sure you get enough juice—you can always make elegant cucumber sandwiches or cool summer vegetable soba bowls with the leftovers. I’ll get to weeding and landscaping the front yard eventually, I swear. Just as soon as I finish this cocktail. 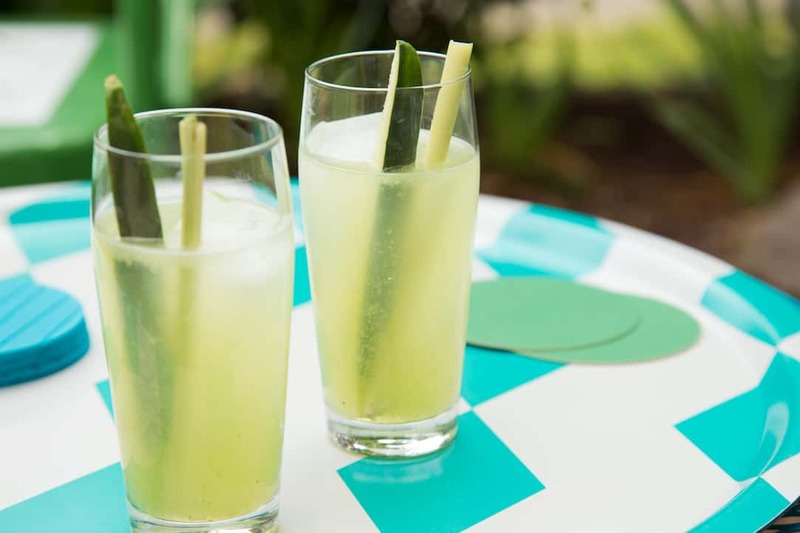 Lemongrass cucumber cocktails are as refreshing as a day at the spa—with a boozy kick! And you can prep them in advance so you can kick back and enjoy. Slice the lemongrass stalks into approximate 3-inch lengths, and discard the tough root and and any fibrous outer layers. Reserve the thin top stalks for cocktail garnish, if desired. Roughly chop the lemongrass into rounds. Pulse the chopped lemongrass with the sugar in a mini food processor (or the small bowl of a large food processor), scraping down the bowl frequently, until the sugar has broken down and the lemongrass has been minced into a damp paste. Add the water to the food processor and pulse to process. Scrape the lemongrass puree into a bowl and refrigerate for at least 4 hours or overnight to let the lemongrass flavor infuse. Juice the cucumbers now—if you don’t have a juicer and are using the food processor method described in the post above, you’ll only have to clean it once this way! Pour the cucumber juice into a quart-size mason jar or pitcher, cover, and refrigerate. Place a fine mesh strainer over a bowl and gently press the lemongrass puree through the strainer to extract all the juice. If necessary, you can also squeeze the puree with your hands until it’s dry. Mix the lemongrass juice and gin or vodka with the cucumber juice. Fill 4 6-ounce or 8-ounce Collins glasses or highball glasses with ice. Divide the cocktail between the 4 glasses and garnish each with a lemongrass stalk and cucumber spear, if desired. Drink up!